Effortless sophistication and authentic Texas friendliness await you at the award-winning JW Marriott San Antonio Hill Country Resort & Spa. 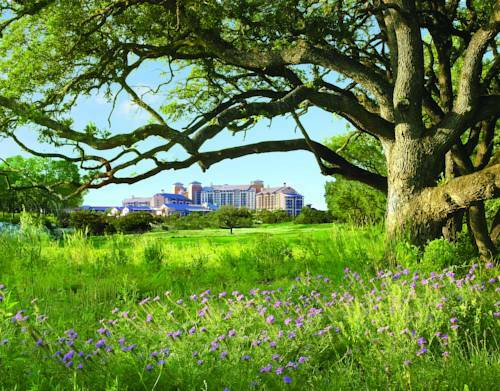 We've firmly established ourselves as a premier destination for memorable vacations in the heart of Texas Hill Country, with a 36-hole TPC San Antonio golf course, an adult-only infinity pool, Lantana Spa, 9-acre water park with a lazy river, seven restaurants, and 288,000 square feet of versatile meeting and event space. Make yourself at home in your expansive room or suite, which features pillowtop bedding, a marble bathroom, and a private balcony. Sample true Texas BBQ, perfectly aged steaks, and authentic Mexican cuisine at one of our resort restaurants, or host a private event with exceptional catering. Stay connected, courtesy of high-speed wireless Internet available throughout the resort. For unforgettable weekend getaways, productive meetings, or fun family vacations, our Hill Country resort will not only exceed your expectations but redefine them altogether. Our signature restaurant offers a contemporary blend of Southwestern and Mexican-inspired fare. We're open daily for breakfast, lunch and dinner; visit us here in San Antonio for a delicious breakfast buffet, or enjoy our daily Blue Plate specials. Unwind with friends and family after an exhilarating day in Hill Country at Crooked Branch. Along with a wide selection of specialty cocktails, our bar offers a creative restaurant menu, which showcases artisan cheeses, BBQ, Tex-Mex dishes and more. Conveniently situated inside the TPC San Antonio clubhouse, 18 Oaks boasts the look and feel of a traditional steakhouse. Indulge in prime cuts of steak, succulent seafood and poultry and quintessential sides. We also offer a popular Sunday brunch! High Velocity is the perfect place to watch your favorite sports event during your time in Hill Country. Our sports bar provides a 120 foot-long media display, in addition to many individual screens. Choose from a vast selection of craft beers. Located inside our signature spa, Replenish Spa Bistro serves healthy, fresh cuisine. Our restaurant uses organic products, hand-picked from our gardens; we also offer smoothies, fine wines and more. Rivertop Grill - Will be closed from 11/1/16 - 2/28/17. Rivertop Grill welcomes you with a classic San Antonio style and delicious cuisine. Our restaurant offers American fare like burgers and sandwiches, as well as exceptional chili and salsa dishes. We also boast specialty cocktails and craft beers. Jump-start your morning here in Hill Country at our on-site Starbucks coffee house. Enjoy fresh-brewed coffee and tea beverages, pastries, snacks and lovely outdoor seating.